Over the last decade Russian–Ukrainian energy relations have worsened. We are now witnessing its nadir. Ukraine has been Russia’s most important ‘gas partner’ as a transit country to Central and Western Europe. In 2016, roughly 45% of all Russian gas in transit to the rest of Europe went through Ukraine. For Russia, this dependency on its ‘little brother’ has been frustrating, especially after the election of pro-Western Viktor Yushchenko as president of Ukraine in 2004. 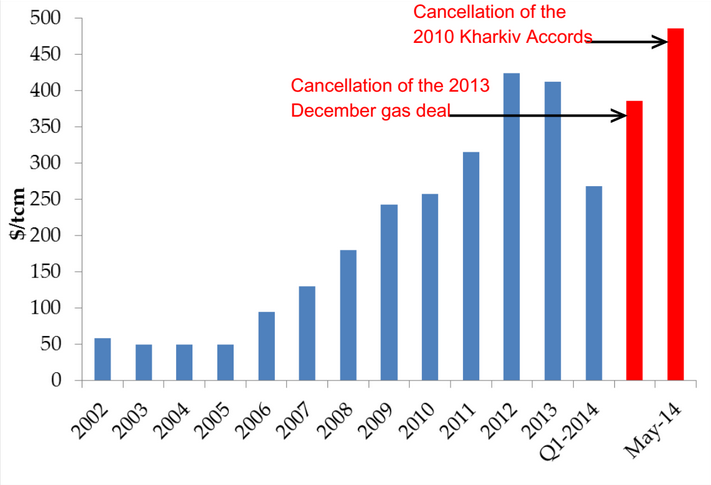 Gas transit has given Ukraine relatively strong leverage over Russia. In 2000, Russian gas exports to Europe accounted for 3.1% of its GDP. Though this figure had fallen to 1.5% by 2015, gas exports still make up a significant share of the Russian economy. Looking beyond the sheer economic numbers, gas transit to Europe is an important issue for the Kremlin for two reasons. First of all, the Russian government controls a majority share in Gazprom, which enjoys a monopoly over Russian gas exports. Therefore, it is an important source of income for the Russian government. Secondly, European countries are highly dependent on Russian gas, which gives the Kremlin strong geopolitical leverage over the EU and other European countries. From the early 2000s onward, Russia has felt threatened over losing some former Soviet states to the West. It has since attempted to establish tighter control over its gas exports to Europe. In 2007, after lengthy and painful negotiations with Belarus, Gazprom managed to acquire a 50% share in Beltransgaz, which controlled gas pipelines on Belarusian soil that form another important transit route for Russia. In 2011, Gazprom extended its control to 100%. Gazprom envisioned a similar scenario for Naftogaz, Ukraine’s state gas company. However, Kyiv refused to give in. Up until today, Ukraine has managed to retain control over its gas pipelines, but the price of Yushchenko’s ‘Western sympathies’ has been high. Under the regime of President Leonid Kuchma – who held Ukraine’s highest office before Yushchenko – Ukraine had a much better relationship with Russia. This was reflected in gas prices: at that time Ukraine was only charged $50 per thousand cubic meters (tcm). In the first contract that was signed between Gazprom and Ukraine in the Yushchenko era, the price was ultimately settled at $100/tcm – a 100% price increase, but still much lower than the market price paid by European countries. In 2009, after a serious dispute in which Russia turned off the gas taps to Ukraine, a ten-year deal was agreed in which Ukraine would pay market price, which was at that point $250/tcm. In 2010, presidential elections took place in Ukraine, and this time Russophile Viktor Yanukovych managed to win. This resulted in a new gas deal that would provide Ukraine with discounted gas. In 2013, both countries arrived at another deal for a reduced gas price. However, in early 2014, in what has become famous as ‘Euromaidan’, Yanukovych was ousted after he refused to sign an EU-Ukraine Association Agreement. As a result, Moscow withdrew both the 2010 and 2013 gas deals, bringing Ukraine’s gas price back to market levels as agreed upon in 2009. While its role as a transit country for gas has given Ukraine some leverage over Russia in the post-Euromaidan ‘Ukraine Crisis’, chances are that this leverage will vanish over time. Russia has made no secret of its efforts to diversify how it transports gas to Europe. Currently, there are four main routes linking Russia and Europe: via Belarus, Ukraine, Turkey, and the Baltic Sea. As mentioned earlier, the Ukrainian route accounted for roughly 45% of transit in 2016, comprising around 80 billion cubic meters (bcm). The routes through Belarus and Turkey are more or less used to full capacity at respectively 41.7 and 13.1 bcm in 2016. However, Nord Stream, which goes directly from Russia to Germany through the Baltic Sea, has a design capacity of 55 bcm and only transported 43.8 bcm last year. Moreover, two new pipelines are currently under construction: Nord Stream 2, which will run parallel to Nord Stream, and TurkStream, which will go through Turkey to Greece and Bulgaria. Their respective capacities will be 55 and 31.5 bcm per year. Theoretically, the sum of Nord Stream’s unused capacity and the prospective capacity of Nord Stream 2 and TurkStream, which is 97.7 bcm, could easily replace the entire volume of gas transit currently flowing through Ukraine. Both Nord Stream 2 and TurkStream are expected to enter into operation in late 2019, the year when Gazprom’s 2009 ten-year deal with Ukraine expires. The potential diversion of Russian gas flows to these new pipelines is alarming for Ukraine for two reasons. First of all, Ukraine risks losing roughly 3% of its GDP. Secondly, Ukraine’s main – if not only – political leverage over Russia is seriously threatened; without the need to pump Europe-bound gas into Ukraine, Russia potentially has a much stronger negotiation position with regard to the current political conflict between the two countries. After all, the Ukrainian economy depends heavily on Russia. In 2015, 21% of Ukrainian imports came from Russia, comprising a wide variety of products. Moreover, Russia is also the destination of 12% of Ukrainian exports. 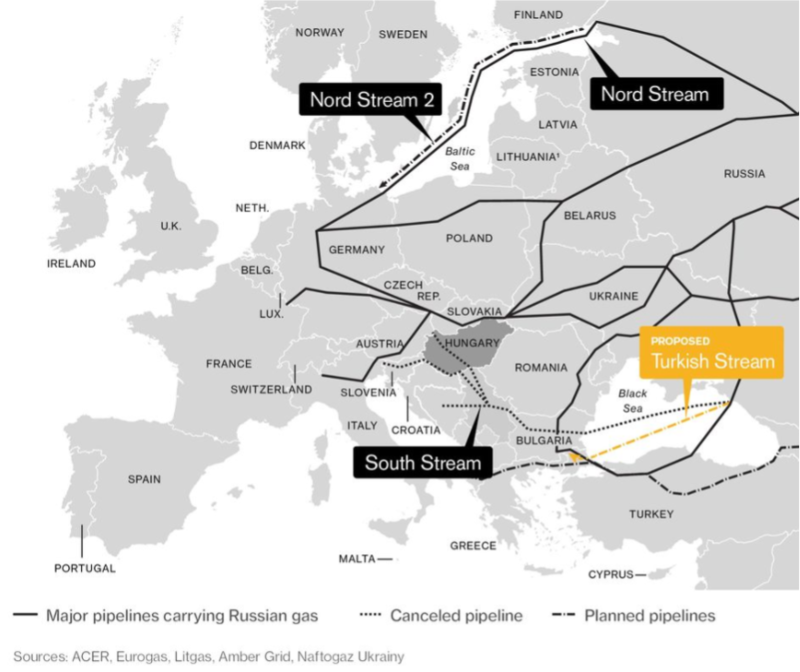 Arguably, Russia is aiming to abandon Ukraine as the major gas transit route to Europe. It risks squandering Gazprom’s reputation as a reliable energy partner for Europe if it continues to depend on the whims of Kyiv. In order to maintain its current position, Ukraine should convince European countries not to follow the Russian example by attracting foreign investment into its gas business. However, achieving this would require thorough reforms in Naftogaz, the state-owned gas company. Currently, it suffers from corruption, government meddling and inefficiency – despite support from the European Bank for Reconstruction and Development (EBRD), and assertions by Kyiv that Naftogaz is undergoing reform. On September 19, the last two independent members of Naftogaz’s Supervisory Board resigned over their frustration with the lack of reform progress. Additionally, up until today Ukraine has failed to do away with its inefficient approach to heating. A remnant of Soviet times, the common, outdated central heating system is put into operation when inside temperatures in residential and public buildings drop below a certain point. There is no open market of energy providers of any kind and consumer prices for gas are determined by the government. With the exception of the 2015-2016 season, Kyiv has been reluctant to increase prices to match import price parity. With general elections coming up in a year and a half, the government would risk vote losses over high energy prices, but this stance might prove a costly mistake for Ukraine in the longer term. Russia is on its way to expanding its options for gas transport to Europe, and Ukraine no longer has a tenable answer for how it will maintain a situation upon which it has become dependent. Major European energy companies such as ENGIE, E.ON and Shell have invested in the Nord Stream pipelines, the second of which will be finished in 2019. If European countries attach high value to the prosperity of Ukraine and its role as a gas transit country – both for economic and (geo)political reasons – they should consider investing directly in Naftogaz in order to reform the company to become a competitive player in the gas market. EBRD support has proven unsuccessful, and with 2019 approaching, time is running out. Should Ukraine lose its position as a transit route, it will be left to the Kremlin’s mercy, pushing the country towards the status of a Belarus-like puppet state. Jelle Baartmans is a graduate student in International Relations at Leiden University.